This post is a small addendum to yesterday's post on the lack of impact of Quantitative Easing (QE). One possible way that QE could affect the economy is via inflation expectations. The above chart shows that this transmission mechanism has not reached the broad public. 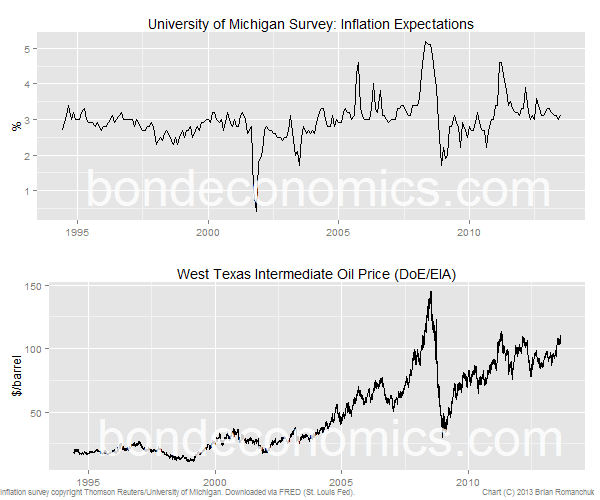 Inflation expectations, as measured by the Thomson Reuters/University of Michigan survey, have been stable near the 3% level it has been stuck at since the mid-1990's (when the current regime of low, stable inflation was reached). As the chart shows, if the Fed wanted to raise inflation expectations, it should be buying oil, not bonds. Such a course of action should actually prove to be negative for the economy (and not stimulative, as some models would predict), which shows the dangers of thinking in terms of a single-good economy model.